Leder band Tweedehands vanaf € 290,00. 8vo. With 12 chromolithographed plates by A. Queyroy (each plate with tissue guard), and wood engraved page borders and title page. 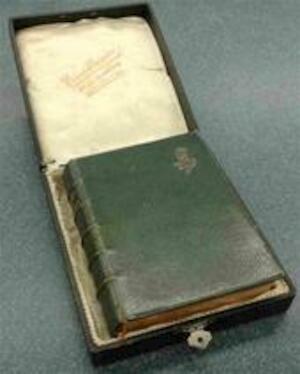 In contemporary crushed grey-green morocco with raised bands and gilt titling to the spine, all edges gilt, a metal decoration to the top right corner of the front board, board edges with a single gilt rule, turn-ins gilt dentelles, silk endpapers. In a box with silk lining. In very good condition, the extremities a little rubbed, with a gift inscription to the flyleaf. The box with lightly worn corners, and some damage to the silk on the hinge.